I’m trying out something new this week, guys. Every once in a while, I’m going to use a relevant pic other than my standard “Eat Here” photo into the Weekly Round-Up. Hopefully this’ll be fun. 🙂 Now, on to the round-up! To start out, here’s some cool NEWS!! : Have you heard about Chef Cat Cora’s book-signing and cooking demo in Orlando next weekend? Check out the specs here! Touring Plans has a guest blog by yours truly all about the Monorail Crawl — a fun way to experience the lounges at the Monorail Resorts. StudiosCentral analyzes prices at Disney’s Hollywood Studios restaurants to determine whether or not the restaurants are a good value cost-wise. DisneyGeek shares his incredible pics, including several food photos, from Disneyland’s D23 Anniversary Event! Keep scrolling through after the linked page to see more. The Plain Chicken has developed her very own recipe for the Butterfinger Cupcake from Disney’s Hollywood Studios Starring Rolls Cafe. We’re thrilled that she first heard about the delicious confection right here on our blog! Imaginerding takes a look at Minnie Mouse’s bookshelves — with a special look at her cookbooks! Babes in Disneyland has a pic of some Cheshire Cat-tail Candy in Disneyland! I totally missed this post last week, but I’m hoping they’re still there! EverythingWDW does a Q&A about the newest Disney World dining plan — the Quick Service Dining Plan. 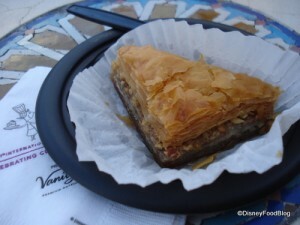 Tasty Chomps is tempting me with photos of the baklava…and other good stuff…from Tangierine Cafe in Epcot’s Morocco. Watch Me Eat visits Epcot’s Club Cool. The Disney Parks Blog shares the news that Disney World chefs were in the White House this week cooking for the Greek Prime Minister! Deb Wills from AllEarsNet tweeted the following pic of Flame Tree Barbecue’s new queue line. Chip and Co shares a review of breakfast at Epcot’s Akershus Restaurant. This one’s especially good for those of you who have little princesses. Disney Every Day visits the Main Street Bakery for breakfast. Yum-o cinnamon rolls! DisUnplugged‘s Culinary Quest family compares and contrasts Disneyland Resort’s Rancho del Zocalo and Cocina Cucamonga. I love the venn diagram at the end! In The Daily Disney from the Orlando Sentinel, food writer Heather McPherson highlights the recipe for the oh-so-tempting Chocolate Crusted Key-Lime Pie from the Grand Floridian Cafe. If anyone wants to make this and send it to me, feel free.